Keith heads up the Family Office practice at BLG Young. He has almost 20 years’ experience advising and managing Irish and International clients in Private Banking, Wealth Management and Investment Banking. 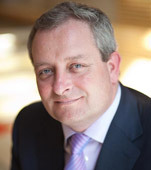 As one of Ireland’s most experienced investment bankers, Keith has worked in Dublin, London, Geneva and Zurich for banks such as Credit Suisse, Nordea Bank, Rabobank and Bank of Ireland. Keith’s banking experience, contacts and client base provide our Family Office clients with a unique service offering.